bezev has been actively involved in various committees of the weltwärts volunteer service programme since 2012 - since 2015 it has been carrying out this intensive committee work as the "weltwärts Competence Centre for the Inclusion of Volunteers with Disabilities" officially mandated by the weltwärts programme. Through this work, it has already been possible to identify and remove numerous structural barriers. In 2014, for example, bezev's commitment led to the inclusion of a regulation for inclusion-related additional costs in the programme's funding guideline, the age limit for applicants with disabilities was raised twice and made more flexible, and communication of the conditions for participation was made more inclusive - these are just three examples of a series of structural improvements, which could be achieved through the political and committee work of bezev in the weltwärts programme and which made it possible for numerous people with disabilities to get involved abroad with the weltwärts programme. 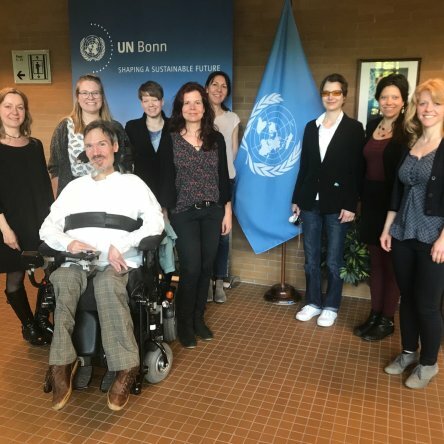 Motivated by the success in the context of the committee and political work in the weltwärts programme, bezev is also committed to improving the conditions of support for people with disabilities in other programmes of foreign engagement/voluntary service. Since April 2017, bezev has been working together with the relevant actors of various other foreign engagement programmes as a " Center of Excellence for Inclusion in Foreign Commitment ", so that people with disabilities will in future be able to access all formats/offers of foreign engagement/voluntary service. To this end, bezev has, among other things, initiated a project advisory board which meets several times a year with important players in international mobility. In addition, bezev is involved in working groups of other programmes (e.g. the Erasmus+ programme) or in the development of strategies of several organisations. The focus of this political work of bezev is always the improvement of financing guidelines and regulations for additional needs as well as the dismantling of further structural barriers which exist in other programmes of foreign engagement/voluntary service. The participants of the project advisory board at their meeting in Bonn.